(CNN) Most of what we know about nicotine addiction in teens, we know from cigarettes. But experts say the technology and chemistry of vaping might pose an entirely different threat. The Mercer County Board of Education has approved a Random Drug Testing Policy for both students and staff (certified & classified). This policy is intended to support the comprehensive educational policies and programs of the District in educating students, parents/guardians, as well as staff, as to the dangers inherent in the unlawful use of drugs. This policy is further intended to provide encouragement to middle and high school students who voluntarily choose to participate on athletic teams, in extracurricular activities, and/or to drive or park on school property to avoid such use and to strive to benefit from effective rehabilitation when such use has occurred. All Pro Dad’s Day is a monthly school program where dads and kids meet to have breakfast and enjoy meaningful conversation that strengthens their relationship. 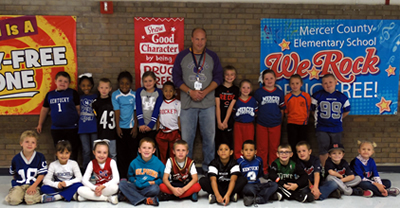 MCES Teams Up Against Drugs Day! Parents Warned about Dangers of Kids "Juuling"
This is a new program for students in the 5th grade. The program will expand to other grades as it develops. Click on the logo for additional information.